What a difference made in the lives of five women! 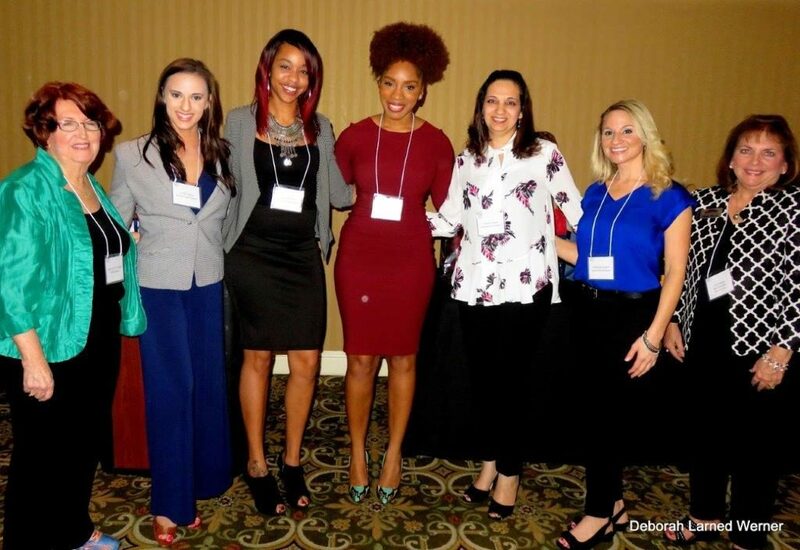 Last January, proceeds raised throughout 2016 for the Tampa Bay BPW Foundation were awarded to Tampa Bay women as educational scholarships. Desarae Smith graduated from Hillsborough Community College with an AA degree in Business Administration, achieving a 3.85 GPA. She is currently enrolled at the University of South Florida, taking 14 credit hours in pursuit of a Bachelor of Arts (BA) degree in Business Administration. Her ultimate goal is to obtain a Master’s degree in Business Administration from that institution and have her own business. Ms. Smith is a member of Phi Theta Kappa honor society. She works part time at Dillard’s as a sales associate and volunteers with her church. As a volunteer with OneChurch, in 2016 she taught Business Etiquette to young teens at Lake Mag Group Home, distributed gift cards to Publix for the homeless, and helped create and produce a commercial for upcoming changes within the church. Ms. Smith is a single mother of two young boys. Heyam Shalabi is currently enrolled at Hillsborough Community College (HCC), seeking an AA degree in Paralegal Studies with the goal of becoming a paralegal in a private law firm. Ms. Shalabi maintained a 4.0 average during the Fall 2015 and Spring 2016 semesters and has an overall GPA 3.5. Mrs. Shalabi is currently taking 12 credit hours and anticipates graduating from HCC in May 2017. Mrs. Shalabi also works part time in her husband’s business and is the mother of five children. Stephanie Hughell is currently enrolled in the LPN-RN (Licensed Practical Nurse-Registered Nurse) program at Hillsborough Community College (HCC), taking 12 course hours with a cumulative GPA of 3.06 in pursuit of an Associate in Science Nursing degree (ASN). Ms. Hughell will complete her ASN degree in May 2017 and then pursue a Bachelor of Science Degree in Nursing (BSN) with the ultimate goal of earning a Master’s Degree in Nursing (MSN). Ms. Hughell works part time for a Home Health Agency, providing nursing care to home bound patients. Ms. Hughell participates in various events on behalf of the Make-a-Wish Foundation and Wounded Warriors. She also volunteers at various facilities she visits for home health care. Samantha Bryant is currently enrolled at the University of South Florida (USF), taking 16 credit hours in pursuit of a Bachelor of Arts (BA) degree in Mass Communications, specializing in Broadcast News. She has a GPA of 3.66. Ms. Bryant served as President of the National Pan-Hellenic Council at USF (2016); Student Ambassador – Women of Color Golf; and Service Chair – Zeta Upsilon Chapter of Alpha Kappa Alpha Sorority, Inc. She is a member of the National Association of Black Journalists. Ms. Bryant served as an unpaid intern with NBC Universal in July-August 2016 as an NBC Universal runner at the 2016 Summer Olympic Games in Rio De Janiero, Brazil. As President of the Pan – Hellenic Council at USF, she created a university-wide initiative called “Mobilizing the Dream” to bring awareness to black students, faculty, and administration concerns and experiences on campus. As part of service as President of the National Pan-Hellenic Council, Ms. Bryant organized canned goods drives, sending over 500 canned goods for families affected by Hurricane Matthew in Haiti and organized programs to donate school supplies to four local elementary schools. Ashley Justice is a graduate of the University of South Florida and is currently pursuing a Juris Doctor (J.D.) degree at Stetson University College of Law, where she is currently taking 14 credit hours and has a GPA of 3.088. She works part-time as a research assistant to Professor Ciara Torres-Spelliscy and is Legal Clerk to Shawn Harrison at Shawn Harrison Associates. In August 2016, Ms. Justice volunteered, distributing campaign material and speaking in support of Jackie Toledo for State of Florida House Representative for District 60. She also volunteered during the 2014 and 2016 campaigns for Shawn Harrison for State of Florida House Representative District 63, fundraising getting signatures for the ballot, and distributing campaign material. Ms. Justice is a Trial Team member, advocating criminal and civil litigation in four mock trials. In Fall 2016, Ms. Justice competed in the Florida Justice Association Competition as a witness and an advocate. She serves as Pro Bono Chair, Florida Association for Women Trial Lawyers at Stetson, planning a pro bono event for a charitable cause each semester. She is the Founder of the Memory Care Foundation from 2014 to the present and participated in the Walk to End Alzheimer’s. Ms. Justice also volunteers for Prevent Child Abuse in America.